Most members of the Central Election Committee are expected to back a motion by MK Ofir Akunis to disqualify Arab MK Hanin Zoabi. A group of MKs seeking to have Arab MK Hanin Zoabi disqualified from running for the next Knesset might be successful, Channel 2 News reported on Sunday. According to the report, most members of the Central Election Committee are expected to back a motion to disqualify Zoabi, who is running as a representative of the Balad party, from running in the upcoming elections. The decision will be then be taken to the Supreme Court. The efforts to disqualify Zoabi are being led by Likud MK Ofir Akunis, who on Sunday submitted a formal request on the matter to Committee Chairman Elyakim Rubinstein. 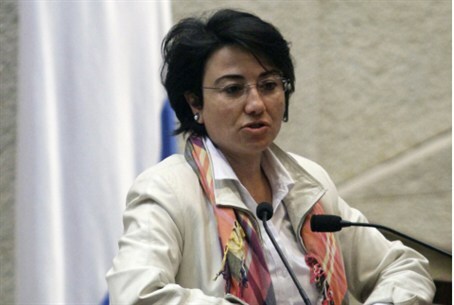 MK Zoabi took part in the 2010 attempt to violate Israel’s naval blockade of Hamas. Zoabi was aboard the ship Mavi Marmara, where IDF soldiers who boarded were violently attacked. A video clip indicates that she knew of the planned attack in advance. Zoabi was later caught rubbing elbows with senior Hamas terrorists. She has also been criticized for anti-Israel speeches, such as one saying that Israel has “no right to a normal life” and a more recent address claiming that “the Israeli occupation” was behind the murder of Israelis in Bulgaria. “According to the law it is required to obtain the support of at least one third of the members of the Central Election Committee. This is a very dramatic step,” Akunis told Channel 2 News on Sunday night, after he submitted the request. “I think she will end up being disqualified, and then - by law - the issue will be discussed in the Supreme Court. However, I do not believe the Court will overturn the decision after Zoabi participated in the Marmara terror attack,” he said. The latest move against Zoabi comes a week after MKs from Yisrael Beytenu filed a request with the Central Election Committee to prevent her entire Balad party from running in the upcoming elections. MK David Rotem filed the petition based on the party's positions in advocating the replacement of Israel with an Arab state. As expected, Zoabi attacked Akunis on Sunday evening and said, according to Channel 2, “The Akunises, Liebermans and the rest of the fascists take advantage of the spirit of the times in which members of the Likud Beytenu are in charge of all of us. It’s time to choose between fascism and democracy." She added, “Indeed, democracy has red lines - disqualification of a Knesset list is one of them. In the present Knesset fascism has an automatic majority, but I do not think that the Court will disqualify me or my party."